Favero Electronics introduced their first power meter, the bePRO, in 2015. It was a hit among cyclists of all levels due to its accuracy, reliability and lower price point when compared to other power meter pedals. Favero is at it again, this time with the Favero Assioma DUO Power Meter Pedals. Like the previous bePRO, the Favero Assioma power meter pedals are a dual-sided power meter with a power sensor located on each pedal. This means the power meter can show independent left and right power, in addition to total power and cadence. However, Favero made several improvements with the Assioma. To begin with, it now installs like a normal pedal. No special tools or instructions needed. Just grab an Allen key and screw it on. In addition, the Favero Assioma pedals are now both ANT+ and Bluetooth SMART compatible. The power meter kept its rechargeable battery, but now boasts 50 hours of battery life. Accuracy was also improved. The Assioma uses Favero’s IAV (Instantaneous Angular Velocity) Power Technology. Using proprietary software and an integrated three-axis gyroscope, IAV takes into account the precise pedaling speed within each pedal stroke. This results in accuracy of +/- 1.0%. In addition, IAV means you can use the Assioma pedals with oval chainrings without any impact to the accuracy of your data! However best yet, the DUO is still the cheapest dual-sided power meter pedal on the market. The Assioma uses Favero’s IAV Power Technology. 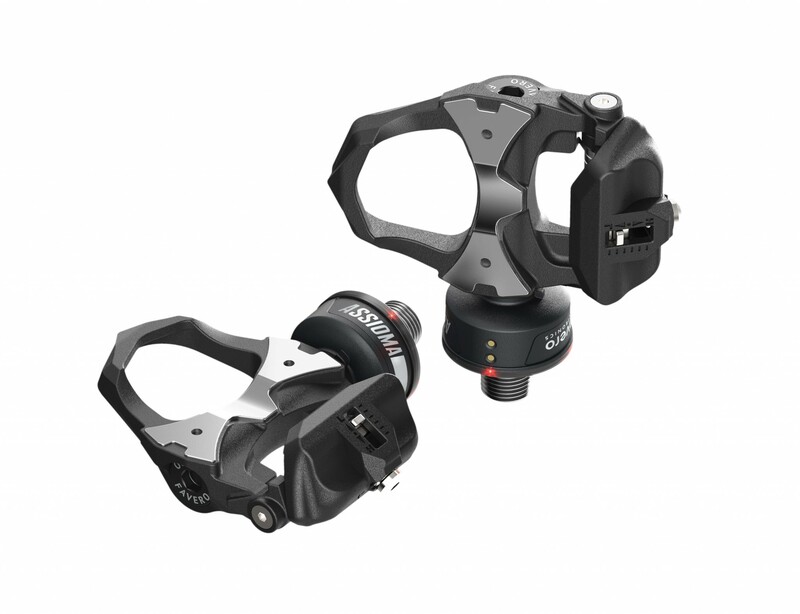 IAV results in accuracy of +/- 1.0% and allows the Assioma pedals to be used with oval chainrings without any impact to the accuracy of your data! With a power sensor on each pedal, the Assioma can measure true left and right power. While some power meters provide an estimated left/right power figure, only a few can provide independent left/right data. Installing a power meter doesn’t get any easier. Grab an Allen key, screw on the pedals, and you’re ready to go. This means you can also move them from bike to bike in seconds! With both ANT+ and Bluetooth SMART technology, the pedals are compatible with your favorite cycling computer, GPS watch, smart phone or tablet. The choice is yours. Using high tech content and cutting-edge materials, the weight of each pedal is only 149.5 grams. This makes it the lightest power meter pedal available. The Favero Assioma uses a rechargeable lithium-ion battery which offers a 50-hour life. When the battery gets low, simply plug them in using the included charger, and you’re good to go again. The power meter is available in two models: the Assioma DUO, a dual-sided system with a power sensor located on each pedal, and the Assioma UNO, a single-sided system with a power sensor on the left pedal only. 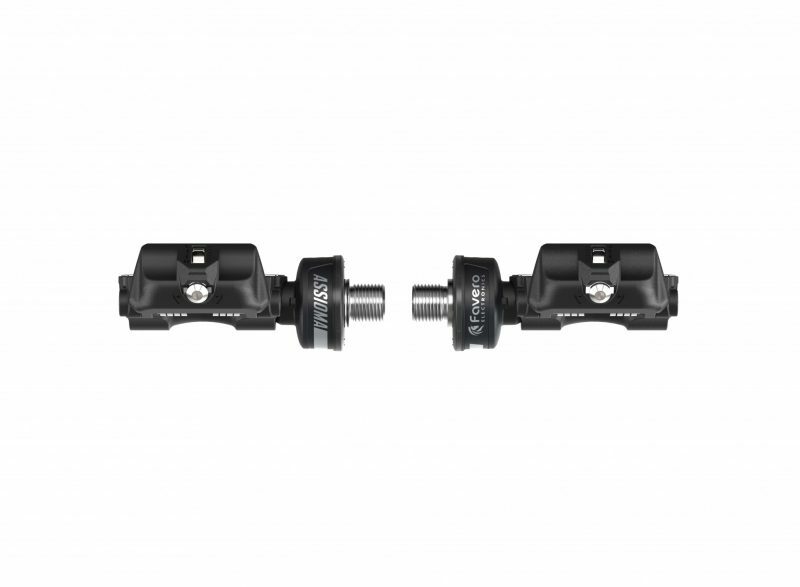 The Favero Assioma DUO Power Meter Pedals come supplied with red, 6° degree float cleats. You also have the option to purchase black, 0° degree (fixed) float cleats. If you have LOOK Kèo original cleats, they will also be compatible with the pedals. Rider Weight Limit 265 lbs. I have about 300 miles on them – accurate, repeatable, ease of installation. Hi Ivan. Our first review on the new Assioma DUO! Glad you like them. Please let us know if there is anything else we can do. Thank you! These pedals are easy to install and use. I’ve had them for over 500 miles and they work perfectly. In my opinion, these are clearly the best power pedals currently on the market. Hi James. Thank you for the review. We’re getting lots of awesome feedback on the Assiomas and the price point sure makes them tough to beat 🙂 Let us know if there is anything else we can help you with! Finally i had the first two rides with the Assioma DUO. -Installation is super easy, like changing normal pedals. The Assioma perform their work totally unobtrusive as it should be. Pedal works from the mechanics top and the data transfer entirely without failures. Better than the Vector 2 which i used before! Hi Steffen. Thank you for the review. This is what we are hearing from other customers as well on the Assioma DUO. Not to mention the price is really good too! I think the folks at Favero really nailed it with this one. I hope you enjoy it and please let us know if there is anything else we can do! Ive had these pedals since Sept and they are great. I have about 900 miles on them and Ive charged them maybe twice. They’re great weight and of great quality, they preform just as well as my previous Ultegra pedal’s. The charging port is a great design thats super easy. The only down side I would say is the cleats took some getting used to, partly do to any cleat change, but they’re not as good as the Keo grip cleats. Customer service was great in helping me with pre-order and shipping. They were definitely worth the wait! Hi Gina. Thank you for the review! 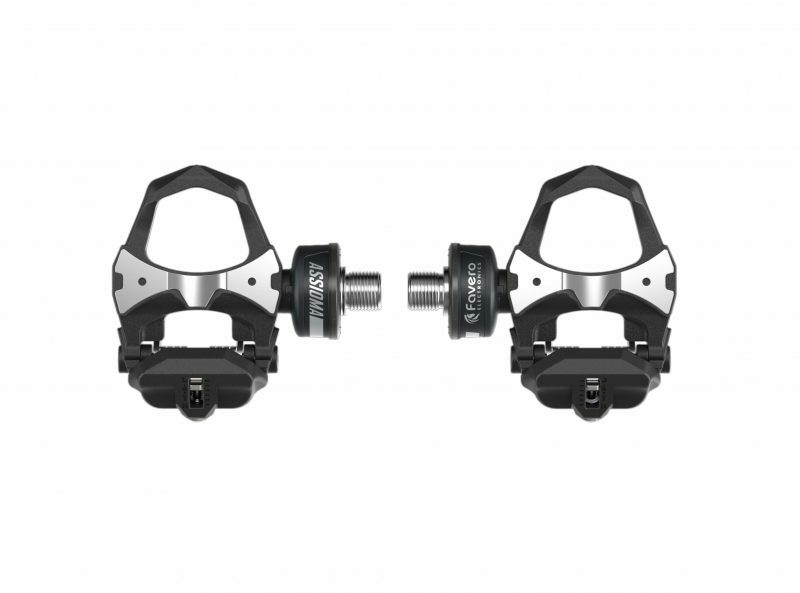 We’re happy to hear you’re enjoying your new Assioma DUO pedals. They make training with power really easy…and who doesn’t want that! Let us know if there is anything else we can help you with! Just a long term review – now over 2500 miles – never had an issue with them connecting, not a single spike and accurate repeatable. Hi Ivan. Thanks for the updated review on your Assioma DUO. Glad they are working out! Let us know if you need anything else from us. Purchased the Assioma DUO pedals in the beginning of October and have done 1000km+ so far. Service from Power Meter City is top notch, responded to my queries and kept me updated with shipping dates. Had to pay import tax into the UK, but that wasn’t a showstopper (although quite a bit of money). Installation is very easy, as is swapping them between bikes. I have traveled with them, used them in temperatures ranging from 0 to about 30’C (UK, Greece, Majorca) with no problems so far. The battery life was one of my concerns, however I have only charged them twice so far, so the battery is definitely not an issue. Even after a flight the battery was ok (not drained, not on all the time). Also, the battery level on the Assioma DUOs can be checked via the mobile app. The only minor issue are the cleats. The ones that come with the powermeter are slippery. I would say it there was a place to keep costs down for Favero, that was the one. The cleats can be easily replaced with ‘Look’ branded ones. Very happy since then, no issues at all. Small bit of advice, as I am a little bit of a cleat destroyer myself, use the Look cleat covers and they will last for ages! I am very happy with this powermeter so far, and it has giving a great boost to my training! Hi Yiannis. Thank you for the great review. We really appreciate customer feedback like as it provides additional insight for the rest of our customers. Additionally, I’m glad you are enjoying them. Favero did a great job with the Assiomas! I got these pedals about a month ago after doing a lot of research on powermeter pedals. They seemed to be the most convenient to set up, reasonably accurate, durable, and well designed. All of my expectations have been met. One of the best parts is that you don’t have to jump through hoops to move them from one bike to another. Unscrew them from one bike, put them on another one, tighten them up and do a quick zero calibration. No special angles or lock nuts, no external pods. No clearance issues. They paired easily with my Garmin 520, and the additional balance and efficiency data they provide has already led to an improvement in my pedaling technique after just a few weeks. I have about 200 miles on them so far, and I am still on the first charge. While this is not a trivial purchase, I would definitely buy them again in a second if I had a do-over. Well worth it. Hi Chris. Thanks for the great review of your Assioma pedals. Sounds like they’re treating you nicely and glad to see you’re putting them to good use. Keep it up! We’re here if you need anything else. These pedals are awesome! I bought them about 3 months ago and have put 1000+ miles on them with almost zero issues. Connected them to my Garmin and the sync has worked beautifully. Hi George. Thanks for the review on your Assioma DUO and the pros and cons list! 🙂 We’ve been using these pedals here since they came out and they are pretty much flawless. The cleat engagement and take some getting used to at first but they get a bit easier with time. So here’s the deal… I am totally new to power meters. For that matter, I’m totally new to the triathlon sport as well. To add to my dilemma I am about as technically savvy as a rock! That being said I have found these pedals to be easy to install. And after some help from Josh over a couple of phone calls I have been able to navigate my way through the calibration process, which is very easy. I was able to check the calibration at a local shop and between their power trainer and the pedals both were nearly identical. I’d leave the difference to when I read my read out and the tech his. The last two perks are these are less expensive than others on the market and that they are easily transferred to other bikes. Thanks for the great review. I’m glad we could help you with your new Assioma DUOs and I’m sure you’re quickly becoming an expert. I hope you enjoy them and we are here if there is anything else we can do. Super impressed with these pedals. My 1st generation Quarq failed after 10 years so I was in the market for a new PM. Having followed pedal-based power meters for a few years, I felt the technology had matured enough to be the best option for multiple bikes. After reading reviews, it was clear that Favero were great value, and after 2 months of use, I can say this is a great product, at a relatively great price. Accuracy seems bang-on, installation was super-easy, and so far battery life has been amazing. Thanks for the review Marc! You pretty much summed it up perfectly…not much to add there! Hope you enjoy them for many years to come. Had been debating which power meter to buy. Glad I chose these. Easy set up and install and accurate. Did have one instance of dropping from garmin 810 but otherwise very happy with these pedals. Hi Joe. Thanks for the review. We’re glad to hear you’re enjoying your Assioma DUOs! I purchased these a few weeks ago and am very pleased with everything. Easy to install and setup: bike computers immediately found the pedals and away you go. Compared to Power Tap Hub, virtual identical power readings. Too bad they don’t come in Shimano STP-MTB style. Hi Doug. If you’re happy, we’re happy! But honestly, these pedals work so well, they just make things really easy. The fact that accuracy and dependability is top-notch is also huge of course. We are here if you have any questions on them. Purchased May/2018. I wanted to wait until I used them to give a proper review. I have to say these are great. Easy to setup, which makes swapping bikes easy. I ride 6-8hrs a week and charged them twice this summer. Just as accurate as any others. I would recommend these to anyone wanting to train with power. Hi Andy. Thanks for the review. I think you pretty much summed it up right there – glad you like them! We have the Assioma DUOs on two bikes here going back about 9 months and they have been bulletproof. We are here if there is anything else you need! These things are fantastic. Installation was extremely easy, paired with my 520 right away. Battery life is great, I charge once every few weeks, but could go a lot longer without needing to (lithium batteries last longer if you keep them topped up). connection is very stable. They are a bit harder to unclip out of than the Shimano pedals I had before, that took a little getting used to. Power meter city has been absolutely fantastic. Had a problem with a previous meter (due to the manufacturer) and pmc went above and beyond to make sure everything was set right. Hi Ken. Thanks for the fantastic review. The Assioma DUO remains one of our best-selling units and we’re stoked to hear you’re putting them to good use! I replaced my Garmin Vector 3 with these due to ongoing issues. The Assioma Duo is fabulous. Easy to install and completely hassle free. I have had no issues with these. Charging is simple and easy and I love the phone app that allows you to check the battery status. Based on my experience and virtually every review I have seen, this is the best overall power meter on the market. Hi Craig. We’re really glad to hear your DUOs are working out well for you. Indeed the reviews are really good on this power meter. Keep up the good work! These pedals are great! Shipping was ultra fast. Best price on the net too. Pedals were easy to install and charging is also fast and easy. Love the app too! Thanks Power Meter City! Hi Tommy. We’re glad to hear you’re loving the Assiomas! Join the club! Please let us know if there is anything else we can help you with. Finally….a decent power meter. After wasting time with some other ones that have now gone bust, I plonked may hard earned cash for these pedal based system. Used it for indoor training and out door riding on different bikes. Flawless. And battery life is excellent. Power meter city provided great support and great price. Finally I’m happy. Let the wattage count begin. Hi Ravin. We’re stoked to hear you found something awesome. I hope you get a ton of use out of it. Thanks for being a great customer! If you’re on the fence about these, just buy them – you won’t regret it. They are stone cold reliable both indoors and out. Battery life is VERY impressive and I’ve never had one bit of suspect data from these pedals. It’s so nice to easily swap them between bikes too. I’m not picky about my cleat choice, but that’s the only possible thing that I think somebody could fault on these. Hi AC. I think your review sums it up pretty nicely – they are just super solid pedals and I’m glad you like them! Please let us know if there is anything else we can do. I believe there are enough positive reviews on the Power pedals themselves, 5 stars. I would like to review Power Meter City as well. 5 stars! Great customer service, they returned emails and answered questions very quickly! Hi Ian. Thank you for the very kind review and we hope you continue to enjoy your Assioma DUO!